“We need more women presidents, like in Brazil,” declares the forceful, smoky voiced Germaine Acogny as she marches down the aisle of the Kennedy Center’s Terrace Theater. “Yes we can! Yes we can!” she chants in her butter-melting French accent, a black feather boa glamorously tossed over her shoulders, her shaved head shining. The Senegalese dancer, making and teaching movement since 1968, is a stunner: tall, lanky, arms that reach on forever and beyond, legs as solid as tree trunks. She walks accessing the full power of her pelvis, not with a thrust, or a bump and grind, but a simple, direct foot stamping or caressing the ground, as necessary. Later on stage, an internal whir stirs her hips with fulsome relish. But Acogny’s dance is not one that takes mere pleasure in her physical instrument: it’s a call to action, a political demonstration, and, taking place on election eve, it’s a call for woman spirit and woman strength to topple what has become the power of the status quo. Joined by video of traffic and slashes of rain and finally a tree in the moonlight, “Songbook Yaakaar” or “Facing up to Hope,” as the piece is called, is a demand for a change of course. But Acogny’s cry for more women presidents in a dance-centric crowd — and the “Fly” program, devoted only to women dancer/choreographers — can also be heard as a call for more fearless women choreographers. We know modern dance’s history, birthed a century ago by powerful, independent women. Yet today the form suffers not only from a lack of funding, but an absence of prominent female leaders. Of late, the field lacks powerhouse women who are creative forces –- where are our Martha Grahams, Doris Humphreys, Anna Sokolows, Katherine Dunhams? With our founding and even second generations gone, our next cohort of women dance matriarchs has not attained the same power, status, prestige and notoriety these earlier women garnered. So much so, that Dance magazine editor Wendy Perron was concerned enough by the lack of prominent women’s voices in the modern dance field to keep a running tally of women choreographers. The accolades, alas, these days seem to go to the Marks, Bills, Joes and Stephens of modern dance. That makes this program — five women, five dances, five distinctive voices — all the more necessary, even in 2010. In “Fly” we have the prescription, if not a cure, for this issue of under-recognized female modern dance role models. The five African-American women of “Fly: Five First Ladies” are not merely notable female choreographers, but “women of a certain age” –- all 60 or older — who continue to assert a powerful stage presence. There’s Bebe Miller, 60 this year, reprising her 1989 solo “Rain,” a juicy evocation of earth and spirit, danced before and upon a grassy rectangle of sod. Clad in a deep red velvet dress on the green grass of an otherwise bare stage, Miller’s spare and intentional movements — a swinging arm, a hand reaching backward, a deep, chewy plie, nuzzling and burrowing into the ground — are accompanied initially by a sparely minimalist score by Hearn Gadbois, then the piece blossoms with Heitor Villa Lobos’ Bachianas Brasilieras No. 5. Part priestess, part contented nature lover, Miller attends and attunes to earth, air, sky and, the title, rain, through her subtle but not inconsequential gestures. From 1972, “The Creation,” a solo richly spoken and danced by Carmen de Lavallade, too, draws on ideas of earthly grandeur and creative spiritual forces. In this case, using poet James Weldon Johnson’s retelling of the Biblical creation myth from “God’s Trombones.” The piece is a dramatic and forceful rendering of other worldly forces and grace, exquisitely performed by a ravishing de Lavallade. Draped in a red gown, her chin lifted and gaze direct, her fingers caress and conjure the still air around her as if ordering up the heavens and earth from whole cloth. In “If You Didn’t Know,” wiry but steel-girded Dianne McIntyre’s solo features jazz inflections, poetry and an audio montage of late filmmaker St. Clair Bourne speaking on the challenges of being a black artist. Tiny, but muscular, draped in a white full-length tunic and skirt, McIntyre offers up her own posturing, leveling the jazz notes with a flutter of her arm, puncturing a well-directed point with a fist, standing in defiance as Gwendolyn Nelson-Fleming sings on tape and pianist George Caldwell winds his way through a song called “If You Don’t Know Me.” It’s both a hot and cool performance, regal yet testy, even impatient in the flings, and leg swoops that bubble and swish around her skirt. McIntyre still has a hold over her audience, and still makes work that matters in pointed ways. Finally, in tandem with Acogny’s political defiance, Urban Bush Women founder Jawole Willa Jo Zollar’s “Bring ‘em Home” offers a rejoinder, equally political and personal. Pumping music by Rebirth Brass Band romps and rolls as Zollar lays crumpled, raising a white handkerchief in surrender. But stoically she rises, rolls back her velvety shoulders and catches the beat. Second lining, Zollar calls her performance, and it reflects the down, but not nearly out, status of post-Hurricane Katrina New Orleans, injecting its rich music and dance culture into her solo. Main line paraders who walk among the first string of bands in a funeral or other procession are, in New Orleans fashion, typically followed by a second line. These amateurs and hangers on are not without skill, as they join the parade to twirl parasols, wave handkerchiefs and march to their own jovial beat. Zollar, too, honors these second liners who made up the most damaged wards of the washed out but not drowned city. With her simple and unaffected steps, she manages to make a statement about dispossession and racism, especially in her vocal call to “Bring ‘em home.” As she marches off, one arm rises, a signifier of praise and defiance. 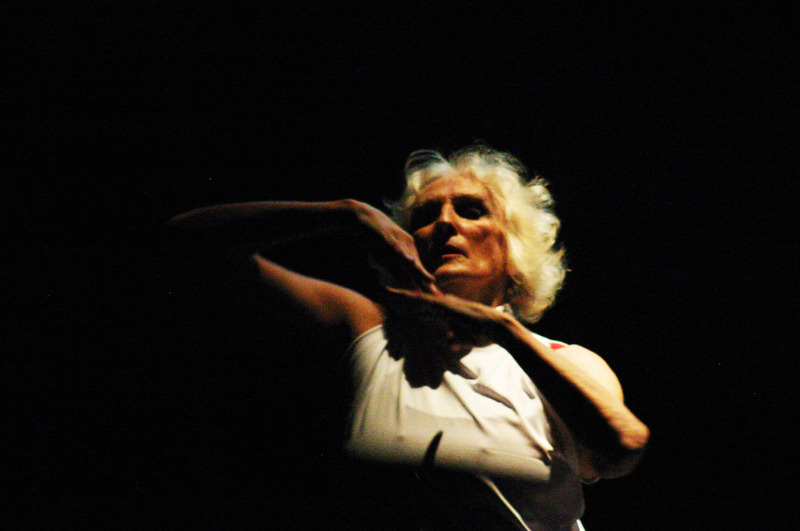 Washington has its own grande dame of modern and post-modern dance: 74-year-old Maida Withers, who founded her Dance Construction Company in 1974. Continuing to make and tour new works, Withers, still a professor at George Washington University, brought her current piece, the excessively titled “Fare Well -– The End of the World As We Know It OR Dance Your Way To Paradise!” to Washington after touring to New York, Kenya, Utah and Brazil. A lengthy solo featuring Steven Hilmy’s electronic sound score performed live, as well as poems by David McAleavey and Alex Caldiero, the work is an unrestrained call to action. Never one to shy away from hot-button issues, here Withers, swathed in a white tunic over bright red undergarments, her shock of matching white hair, becomes Gaia, a literal mother earth, a crone warning all to heed the environmental chaos. The video backdrop by Ayodamola Okunseinde features a moving landscape of dried earth, cracked ice, mountains, deserts, smoke and fire, along with wildlife. First carrying an empty water jug, Withers, still lanky and fearless, engulfs the Dance Place black box stage. She’s all sharp elbows, wide lunges, expansive low leaps and crashes to the ground. At one point from a stooped position, she arises to a tremor, fists vibrating as drums beat a warning. At another, her jaw drops open, face contorted in a silent scream. Withers remains tireless and “Fare Well” proves to be her tour de force. The quietly introspective trio, “Naked Truth” followed, danced by broad-chested but gentle partner Anthony Gongora, quirky, quick-footed Tzveta Kassabova and petite, gazelle-like Giselle Ruzany. This first performance beats with a lifeforce, especially in the wake of Withers’ urgent admonition: “What do I know about … children … dwindling rivers … deserts … groundwater used up …?” There’s more zest and ease to “Naked Truth” with its restful, friendly partnerships intertwining and separating then re-alligning. It serves as an apt anecdote, following Withers’ razor-sharp screed.